RayBio® Human/Mouse/Rat Amylin (IAPP) EIA Kit optimized for serum and cell culture medium. Competition-based ELISA on a 96-well strip plate. 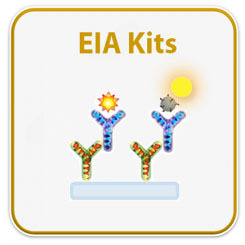 Specificity: Cross Reactivity: This EIA kit shows no cross-reactivity with any of the cytokines tested: Ghrelin, Nesfatin, Angiotensin II, NPY and APC. 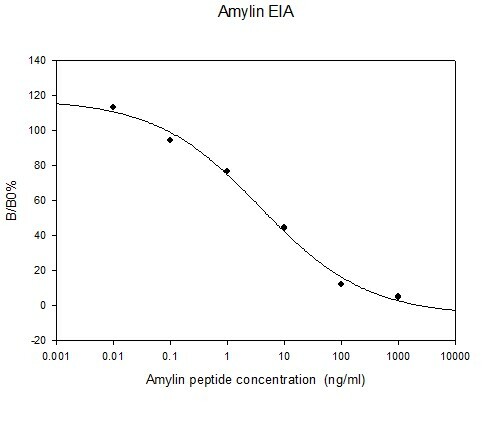 Standard, Biotinylated Amylin peptide, and Positive Control should be stored at -20°C after arrival. Avoid multiple freeze-thaws. The remaining kit components may be stored at 4°C. Opened Microplate Wells and antibody (Item N) may be stored for up to 1 month at 2° to 8°C. Return unused wells to the pouch containing desiccant pack and reseal along entire edge.